In the second round, you have many choices to make. The rules for your second turn are the same as for all your later turns. However, because you have no military cards, some options are not yet available to you. Play your civil and military actions (your Action Phase). No one replenishes the card row in the first round. But for the rest of the game, this is the way each player will start his or her turn. Remove the indicated cards at the front of the card row. Slide the remaining cards to the left. Deal new civil cards to the empty spaces. The number of cards to remove depends on the number of players, as indicated by the notation above the three leftmost spaces. In a 2-player game, remove the cards in the first 3 spaces. In a 3-player game, remove the cards in the first 2 spaces. In a 4-player game, remove the card in the first space only. Of course, sometimes one or more of these spaces will already be empty because the previous player took the card. In that case, the card has already been removed for you; you don't remove a different card instead. The cards removed do not come back into the game. You can keep the civil card discard pile in the box so that they do not accidentally get mixed back in. The card row now has one or more empty spaces. Slide each card through the empty spaces to the left. When you are done, all the empty spaces will be together on the far right. The order of the cards will not change. Thus cards move from more expensive spaces to less expensive spaces. The card row now has several empty spaces, all of them on the right. Deal one card from the current civil deck to each empty space. When you are done, each space of the card row will have one card. When replenishing the card row for the first time, the cards come from the Age A civil deck. (In the unlikely event that you run out of Age A civil cards, fill any remaining empty spaces by dealing from the Age I civil deck). When the card row is replenished for the first time, Age A ends and Age I begins. Put the rest of the Age A civil deck in the box. Shuffle the Age I civil deck and place it on the lighter half of the current age board. From now on, the card row will be replenished with Age I civil cards. Shuffle the Age I military deck and place it on the darker half of the current age board. Players will be able to draw from it during their End-of-Turn Sequences. 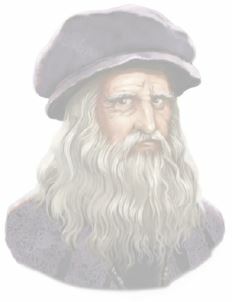 Placing Age I decks on the current age board is the only thing that happens at the end of Age A. Ages I and II end with additional steps, which will be discussed later. Note: The starting player is the one who makes the transition from Age A to Age I, but for the rest of the game, there will be nothing special about the starting player's turn. You always begin your turn by replenishing the card row, even if you are not the starting player. On your second turn, you have all your actions at your disposal: 4 civil actions (white) and 2 military actions (red). Whenever you spend an action, move a token of the corresponding color off your government card. You can use these actions to do various things, listed here. You may perform your actions in any order, possibly alternating between civil and military actions if you wish. Unless otherwise specified, you may perform the same action as many times as you can pay for it. You do not have to use all your actions. Tip: On your second turn, we recommend using only civil actions. You do not need to build military units early in this peaceful variant of the game. By leaving your military actions unused, you will be able to draw military cards at the end of your turn. (*) It is unlikely that you will perform these actions on your second turn, but we will describe them here anyway, in their proper context. (**) These actions require military cards, which you do not have yet. They will be described in the next chapter. Note: This list of all possible actions is also on the quick reference sheet. You may take a card from the card row. The rules are the same as in the first round. In addition to leaders, wonders, and action cards, you may have an opportunity to take technology cards. You may never take a technology card with the same name as a technology you already have in your hand or in play. When you take the technology, you put it in your hand. It has no effect until you put it into play, as explained later. The number of civil cards in your hand is limited by your civil action total - the number of white tokens you have, whether on or off your government card. If you are already holding that many civil cards, you may not put any more in your hand. Note: This does not prevent you from taking a wonder. Wonders go directly into play without entering your hand. You begin the game with 4 white tokens. So you have a hand limit of 4 civil cards, regardless of whether your civil actions are available or spent. You will not be able to hold more than 4 civil cards until you increase your number of civil actions. Tip: Take only cards that you intend to play. There is no easy way to discard civil cards. You may choose to increase your population. This gets you more workers. Pick up the rightmost yellow token in your yellow bank. Pay the amount of food specified by the white number under that section of the yellow bank. Put the yellow token in your worker pool. It is now an unused worker. 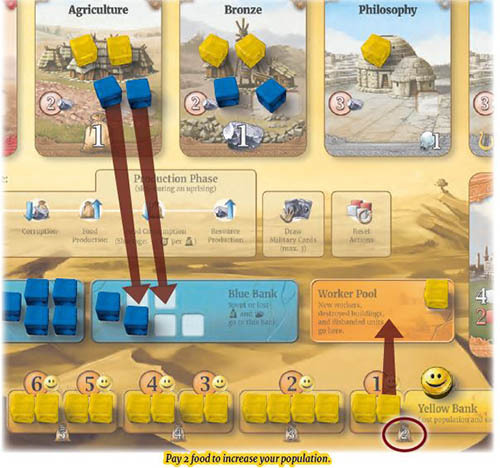 When you increase your population for the first time, it costs you 2 food, as depicted under the rightmost section of your yellow bank. To pay food, move blue tokens representing the specified amount from your farm technologies to your blue bank. You should have 2 blue tokens on your Agriculture card after the first round. The symbol at the bottom of the card means that each of those is worth 1 food. To pay 2 food, move 2 blue tokens from Agriculture to the blue bank. You cannot pay with the blue tokens on your Bronze card because they represent resources, not food. If you don't have enough food, you can't increase your population. On your second turn, you usually don't have enough food to increase your population more than once. Do not forget: when paying, you never give up the blue tokens; you just return them to your blue bank. You have moved the rightmost yellow token from your yellow bank to your worker pool. Now, the token represents an unused worker. However, you have one less token in your yellow bank. That means the population density of your civilization is a bit higher. You still have one more token in that section of your yellow bank. So the next population increase will again cost only 2 food. Once that section is empty, however, increasing population will cost you 3 food. Also, removing the last yellow token from that section will reveal the symbol, which means your civilization will consume 1 food at the end of your turn. As your number of workers increases, your yellow bank empties. This represents that less land is available for expansion. It costs more food to maintain and increase your population. If you ever empty your yellow bank completely, you will be unable to increase your population any more. You will have reached maximum population density. Another effect of increasing population is represented by your happiness indicator. There is a reason this is joined to your yellow bank. Each empty subsection requires you to produce an additional happy face if you want to keep your population happy. Unused workers can be put to work. Building a new farm or mine may be a good idea. This increases your food or resource production. 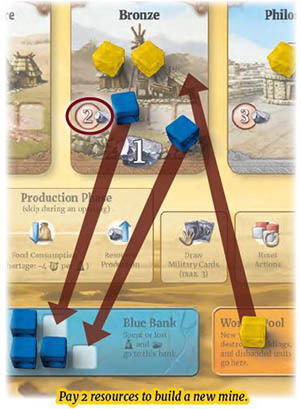 Pay the resource cost depicted on one of the farm or mine (brown) technology cards you have in play. Move one of your unused workers to that farm or mine technology card. Paying resources works the same way as paying food. To pay resources, move blue tokens representing the specified amount from your mine technologies to your blue bank. An Age A farm or mine costs 2 resources, as specified by the Agriculture or Bronze card. Your Bronze card has 2 blue tokens from your first turn's production. Each is worth 1 resource, as specified by the symbol at the bottom of the card. You can afford to build either a farm or a mine. The tokens go to your blue bank. If you can't pay the cost, you can't do the action. When the worker is placed on Agriculture or Bronze, the worker becomes an Age A farm or mine. This has no immediate effect, but at the end of your turn, the card will get one more blue token than it would have otherwise. Your production will be higher. Once you develop better farm or mine technologies, you may build better farms or mines. But you may continue to build Age A farms and mines, if you wish. Pay the resource cost depicted on one of the urban building (gray) technology cards you have in play. Move an unused worker to that urban building technology card. Update your ratings. (See the Updating Your Statistics box on the facing page). Urban buildings on Philosophy or Religion have a resource cost of 3. You have only 2 resources, so you will probably not be able to build an urban building on your second turn, unless you have help from an action card. (Action cards are explained later). Each worker on an urban building technology card represents one building of the corresponding type and level. At the start of the game, you have only two such technologies - you may build level 0 labs and level 0 temples . Later, you may develop higher level labs and temples, as well as other types of urban buildings such as libraries, theaters and arenas. All are built according to the same rules. The symbols at the bottom of the urban building technology card depict the contribution of each building - that is, of each worker on the card. As soon as you build an urban building, you need to update your ratings, as explained in the Updating Your Statistics box. Example: If you build a second lab, then it will also produce 1 per turn. Move your science rating marker to the +2 space. Your science rating is now 2. If you build a temple, your culture rating and happiness rating increase to 1. If you build a second temple, both ratings increase to 2. The number in the bottom right corner of your government card is your urban building limit. It specifies how many cities your civilization can support, which is represented by how many buildings of each type you have. The urban building limit printed on your government card specifies the maximum number of buildings you may have of one type. An urban building's type is specified by the icon in the upper right corner of the card it is on. The urban building limit applies to all buildings of the same type regardless of level. You may build one more lab, but then you are at your limit - Despotism has an urban building limit of 2. You cannot build a third lab (even if you develop a better lab technology) until you change to a government with a higher limit. However, you may build up to two temples regardless of how many labs you have. You may build any number of farms or mines. The urban building limit does not apply to them. Because your first game is less militaristic, you probably don't want to build a military unit on your second turn. But you can if you want to. Building a military unit works the same as building an urban building except you pay a military action instead of a civil action. Pay the resource cost depicted on one of the military unit (red) technology cards you have in play. Move an unused worker to that military unit technology card. Update your strength rating. (See the Updating Your Statistics box on the facing page). Note: The resource cost is printed on a red background to remind you that building a military unit is a military action, not a civil action. Each military unit contributes to your strength rating by the value depicted on the card. Thus if you build another unit on your Warriors card, your strength rating increases by 1. There is no limit to the number of military units of each type you may have. A leader in your hand has no effect until you put it in play. Put the leader on the table next to your player board. Update your statistics, if necessary. (See the Updating Your Statistics box on the facing page). You may take a leader and put it into play on the same turn. Just remember to pay the actions for taking it and the action for putting it into play. Once the leader enters play, his or her effect immediately begins to apply. Some leaders have symbols on the bottom of the card that affect your statistics. The text on the card describes effects that may give you special options and privileges. 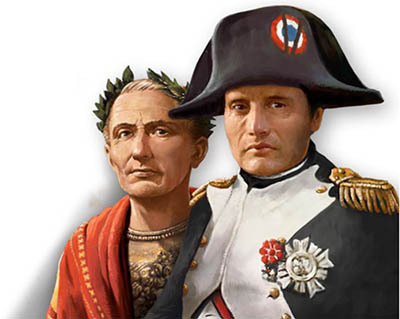 Caesar gives you an extra military action and increases your strength rating by 1. He also gives you a new option in the Politics Phase, which we will explain later. Moses does not change your statistics, but he adjusts the rules for how you increase your population. Some leaders are explained in more detail in the Appendix on the back page of the Code of Laws. If you already have a leader, he or she automatically retires and leaves play when you play a new one. The old leader's effect ceases to apply. The new leader's effect applies instead. As a sign of support from the retiring leader, you gain one civil action back. Remove the previous leader from play. Put the new leader in play. Update your statistics, if necessary. (Do not forget to subtract the effect of the previous leader). Gain 1 civil action back (move it back onto your government card). You are allowed to use the benefit of a leader and then replace him or her on the same turn. Note: Paying the action then gaining it back does not mean you can replace your leader for free. If you have no available civil actions, you cannot replace your leader. Example: You have Moses as your leader. On your turn, you increase your population for one civil action (with the discount Moses provides), then take an Age I leader from the middle section of the card row for two actions, and then play that leader for your last civil action. Moses leaves play and you get one civil action back, for whatever you want to do next. If you had increased your population twice before taking the Age I leader, you would be unable to replace Moses this turn because you would have no civil actions left. Once you have taken a leader from the card row, you may never take another leader from that age. Playing the leader costs 1 civil action. If you already have a leader in play, the old leader is automatically removed from play and you get1 civil action back. A leader's effect applies while it is in play. A wonder enters play turned sideways to indicate it is unfinished. Each wonder card has a row of numbers at the bottom of the illustration. Each numeral represents one stage of the wonder, and the value is the resource cost of that stage. Example: The pyramids are built in three stages. The first stage costs 3 resources, the second stage costs 2 resources, and the final stage costs 1 resource. Pay the resource cost of the leftmost uncovered stage. Take a blue token from your blue bank and use it to cover up that numeral to indicate you have built that stage. You may build multiple stages of a wonder on the same turn, if you have enough resources and civil actions. You may build stages even if you took the wonder from the card row this turn. The blue tokens on your wonder do not represent food or resources. They just mark the progress of construction. Urban building technologies and military unit technologies have no effect when they first enter play. They require workers. Each worker contributes the amount depicted at the bottom of the card. If there is one worker on the card, the effect is applied once. If there are two workers, it is applied twice, etc. If the card has no workers, it has no effect on your statistics. Other cards (special technologies, governments, leaders, completed wonders, etc). do not need and cannot have workers on them. The depicted effect applies as soon as they enter play (or as soon as they are completed, in the case of wonders). The effect always applies exactly once. Note: An effect may be depicted with numerals or with a repeated symbol. The meaning is the same (a contribution of 2 to the corresponding rating). Your ratings are the 4 statistics tracked by your rating indicators. Your ratings are completely determined by the cards and workers you have in play. The rating indicators simply keep track of your totals so you do not have to recalculate every time you want to know how much you have. If a card requires workers, your ratings can change when you move a worker on or off the card. If a card does not require workers, your ratings can change when the card enters or leaves play. Whenever your ratings change, update your indicators immediately. Note: Some cards, especially leaders, contribute to your ratings based on other cards in play. And some cards alter the way other cards contribute to your ratings. Return all blue tokens from the card to your blue bank. Straighten the card to indicate that it is completed. Update your statistics, if necessary. (See the Updating Your Statistics box). When a wonder is completed, any effect printed on it begins to apply, and you adjust your statistics according to the symbols printed at the bottom of the card. Note: Unlike farms, mines, urban buildings, and military units, a wonder does not need and cannot have a worker on it. Example: You spend your last civil action to build the final stage of the Pyramids. The Pyramids' effect is to give you an additional civil action. Take a white token from the box and put it on your government card. You may spend it this turn and in all future turns. None of your ratings can ever go below zero. If the total contribution of your cards and workers is negative (not likely, but theoretically possible) then your rating is 0. Your happiness rating cannot go above 8. If your cards and workers produce more than this, your civilization has 8 happy faces. Your science, culture, and strength ratings have no maximum. If your rating exceeds the maximum depicted by the indicator, flip your marker over to the other side and start counting again from zero. For example, a flipped-over science rating marker on space 5 represents a science rating of 30. Some cards in play may give your civilization a colonization modifier. This symbol is on very few cards and it applies only during colonization, which is explained later. It has no indicator because it is easy to calculate when you need it. If an action total increases, take the corresponding number of white or red tokens from the box and put them on your government card. They are available. If an action total decreases, return the corresponding number of white or red tokens to the box. Return spent actions first. A wonder enters play unfinished as soon as you take it from the card row. Its effects do not apply while it is unfinished. You may not take a wonder from the card row if you already have an unfinished wonder in play. Wonders are built in stages. Each stage requires a civil action and resources. A wonder's effects apply once it is completed. When you take a new wonder from the card row, you must pay 1 additional civil action for each wonder you have already completed. Pay the science cost depicted in the upper left corner of the technology card. Put the technology into play. The effect of putting a technology into play, if any, depends on the card, as will be explained later. When the rules and cards refer to your technologies, they are referring only to those technology cards you have in play. To pay the science cost, move your octagonal science points counter that many spaces back on the science points track. If you do not have enough science points, you cannot develop the technology. On your second turn, you will probably be unable to develop any technology because you have only 1 science point. When you develop a new farm or mine technology, put it above your existing technology of the same type. The cards may overlap, but don't cover the resource cost of the lower level card. The newly developed technology does not represent a farm or mine, just your knowledge of advanced techniques. It does not produce anything until you put workers on it. You can build a new farm or mine on this card if you pay the corresponding resource cost. You still have the ability to build lower level farms and mines. It is also possible to upgrade lower level farms and mines to a higher level, as will be explained later. When you develop a new urban building technology, check its type, as represented by the icon in the upper right corner. If you already have a technology of this type, put the higher level one above the lower level one. If it is a new type, place it in its own column next to your other urban building technologies. The new urban building technology has no effect until you put a worker on it. You can do this by building a new building or by upgrading an existing building, as explained later. When you develop a new military unit technology, check its type. If you already have a technology of this type, put the higher level one above the lower level one. If it is a new type of military unit technology, place it in its own column next to the others. The new military unit technology has no effect until you put a worker on it. You can do this by building or upgrading a military unit. Note: The science cost is printed on a white background to remind you that developing the technology requires a civil action. The resource cost is on a red background to remind you that building, upgrading, or disbanding a military unit costs one military action. A special technology's effect applies as soon as it is developed. It does not require (and cannot have) workers. You cannot have two special technologies of the same type. If you develop a new technology with the same icon in the upper right corner, the higher level technology stays in play and the one with the lower level is removed. Some special technologies increase your strength rating and colonization bonus. Some give you extra civil and military actions, or even blue tokens. When you develop one of these, you update your statistics. (See the Updating Your Statistics box on the previous page). Construction technologies do not adjust your statistics, but they make your urban buildings less expensive. If you are building an urban building, its resource cost is lower by the amount specified on the construction technology card. (The cost adjustment depends on the age of that building's technology card). Construction technologies also allow you to build multiple stages of a wonder for one civil action, if you have enough resources to do so. You pay the sum of the costs all at once, then move the corresponding number of blue tokens from your blue bank to the wonder card. There are two ways to develop a government technology. We explain them both in the next section. Your civilization always has exactly one government in play, represented by an orange technology card. You begin with Despotism, the government printed on your player board. Later, you may replace it with better governments. Advanced governments give you more civil and/or military actions and increase your urban building limit. Some governments also affect your ratings. There are two ways to change your government: peaceful change or revolution. Both ways count as "developing a technology" and both have a science point cost. However, their costs are different. That is why governments have two science point costs in the upper left corner. You may change your government through natural evolution. As a society grows and becomes more enlightened, their government can change to reflect the new social consciousness. Peaceful change costs more science points, but your citizens barely notice what is happening. A peaceful change of government works like developing any other technology. Pay the higher science cost depicted in the upper left corner of the technology card. Put your government in play, previous government. Update your statistics (especially your number of civil and military actions). Cover the previous government with the new card. The previous government is thus removed from play (although in the case of Despotism, it is still physically part of your player board). Any unspent actions that were on the previous government are moved onto the new government. If your new government offers more civil or military actions than the old one, you take new white or red tokens from the box to reflect your new total, as explained in the Updating Your Statistics box on page 11. These new actions are available for use this turn. Changing your government through revolution costs less science, but it paralyzes your civilization for one turn. You spend all your civil actions in the revolution. Pay all your civil actions. You cannot declare a revolution if any of your civil actions is spent. Pay the lower science cost. Put the government in play, replacing the previous government. Update your statistics (especially the number of civil and military actions). If you gain any new civil actions, spend them without effect. You must use up all your civil actions for a turn to declare a revolution. You cannot spend any civil actions before the revolution (unless you spend an action and get it back - say, by replacing a leader). This means you won't be able to take a government technology from the card row and declare a revolution on the same turn. The middle steps are the same as a peaceful change of government. The big difference is that you will end with all your civil actions spent, including any that you gained from the revolution. Your military actions are not affected. You may spend any of them before or after the revolution, and any that you gain from the new government will be available to spend. Example: To declare a revolution to Monarchy, you spend all four civil actions (so it will probably be the only civil action you do this turn) and pay 2 science. You take 1 new white and 1 new red token. The red token goes on the Monarchy card, as do any unspent military actions you had before the revolution. The white token ends up beside the government card. It is spent as part of the revolution. Technologies are cards. Six of these cards are preprinted on your player board. The others must be developed. When you take a technology from the card row it goes into your hand, where it has no effect. You are not allowed to take a technology with the same name as one you have in play or in your hand. You put a technology into play with a "develop" action. This costs one civil action and a certain number of science points. Most technology cards do nothing until they have workers. See Summary - Workers on page 14. You may have multiple levels of such technologies, even if they are the same type. Special technologies, the blue ones, cannot have workers. They take effect as soon as they enter play. Each special technology has a type icon in the upper right corner. You never have two of the same type in play. The lower level one is automatically removed from play. A new government always replaces the old government in play, regardless of their levels. Declaring a revolution is also developing a technology, but the rules are somewhat more complex. You will not get a chance to upgrade your farms or mines on your second turn, but the action is theoretically available to you on all turns after the first. As was stated earlier, if you have a higher level farm or mine technology you can either build a farm or mine on it directly, or you can upgrade one that you already have. 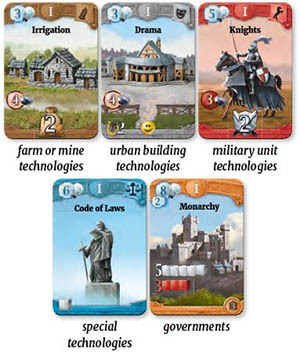 Choose a farm (or mine) and a farm (or mine) technology card of a higher level. Pay resources equal to the difference between the resource costs. Move the worker from the lower level card to the higher level card. 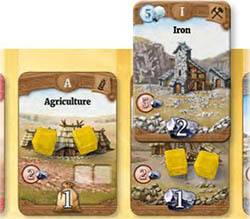 Higher level farm and mine technology cards follow the same rules as those from Age A. The difference is that a blue token on a higher level card is worth more. During the Production Phase, each worker on the card produces only 1 blue token, but the token is worth the value printed at the bottom of the card. For example, 1 blue token on Coal counts as 3 resources. In the illustration above, you have 6 resources. During your Production Phase, you will produce 5 more resources - two blue tokens on your Age I card and one on your Age A card. When you pay food or resources, returning a blue token to the bank counts as paying the amount depicted at the bottom of the card. Example: In the previous example, if you need to pay 2 , you may do so either by returning one blue token from the Age I card, or by returning two blue tokens from the Age A card. When paying, you may (and sometimes must) exchange a blue token of higher value for one or more tokens of the same or lesser total value. Exchanging only works in one direction - from a higher value to a lower value. You may never exchange tokens of a lower value for tokens of a higher value. For example, you cannot move 2 blue tokens from Agriculture to your blue bank and put 1 on Irrigation. 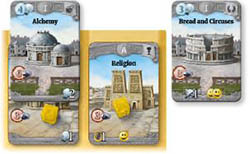 Choose an urban building and an urban building technology card of the same type and higher level. Example: If you have Masonry in play, buildings of Ages I and II cost 1 less. An Age I lab costs 5, but an Age A lab still costs 3. So you pay only 2 to upgrade from Age A to Age I. In this case, the card makes upgrading cheaper. However, upgrading from Age I to Age II costs the same as it would without Masonry. Both levels have the same discount. This is analogous to upgrading an urban building, except that it costs 1 military action instead of a civil action. Choose a military unit and a military unit technology card of the same type and higher level. Note: As with farms, mines, and urban buildings, the type depicted in the upper right corner is important. You can upgrade warriors to higher level infantry units, but not to cavalry or artillery. This is usually not a good idea, but in some circumstances, it might be your only way to get an unused worker. Move one of your workers from the chosen brown or gray technology card to the worker pool. That's it. You do not get any resources back. Move one worker from the chosen military unit technology card to the worker pool. 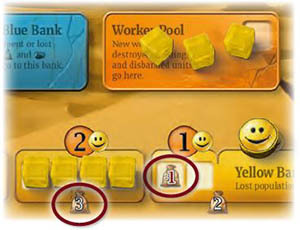 A worker is a yellow token in your play area, but not in your yellow bank. A worker that is not on a card is an unused worker. A worker on a technology card is a farm or mine, an urban building, or a military unit. It has the same level and type as the card. You can move an unused worker to a card with a "build" action. You pay a resource cost. You can move a worker from a lower level card to a higher level card with an "upgrade" action. You pay the difference between the two resource costs. You can remove a worker from a card with a "destroy" or "disband" action. It becomes an unused worker. Farms, mines, and urban buildings are built, upgraded, or destroyed for 1 civil action, military units for 1 military action. The number of urban buildings of one type is limited by the urban building limit of your government card. Farms, mines, and military units are not limited in this way. Unlike the other cards we have discussed so far, action cards do not enter play. You play them, and they have a one-time effect. An action card cannot be played during the same Action Phase in which it was taken. 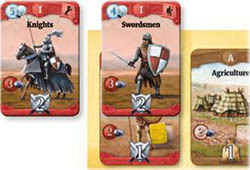 Thematically, the action cards represent your civilization's preparation for future tasks. From a game-flow standpoint, this delay between taking an action card and using it makes it easier to plan your next turn. While others are playing, you already know what food and resources you will have and you know which action cards you will be able to use. Your next turn will not be heavily influenced by whether a certain action card is available in the card row. Follow the text. If the effect requires you to perform an action, you do so without paying an additional civil action. Discard the action card. It will not enter the game again. Move your octagonal counters ahead the corresponding number of spaces. (You are scoring points. This does not affect your ratings indicators). When you gain food, move blue tokens from your blue bank to your farm technology cards to represent the amount gained. For example, you can gain 2 food by moving 1 token to Irrigation or 2 tokens to Agriculture. You may move blue tokens even onto cards that have no workers. When gaining food or resources, you are not allowed to move tokens off cards. For example, if you have Bronze (tokens are worth 1) and Coal (tokens are worth 3), you gain 2 resources by moving 2 tokens from your blue bank to Bronze. You can't move a token from Bronze to Coal. You can't put a new token on Coal and then take back one from Bronze. If the card specifies that you perform one of the actions normally available to you in your Action Phase, you perform it according to the usual rules, except you do not pay its civil action cost. You already paid for it when you played the action card. You still pay the resource cost, but these cards specify a discount, which is cumulative with any other discounts you may have from cards in play. If this discount would reduce your cost below 0, your resource cost is 0. Note: Engineering Genius only allows you to build one stage of a wonder, even if you have a technology that would allow you to build more for one civil action. If for any reason you cannot perform the specified action, then you cannot play the action card. These cards also specify that you perform an action. You perform the action according to the usual rules, except you do not pay the civil action cost. The card offers no discount, so you must pay the entire food cost or science point cost. Once you have completed the action, you gain the reward. If you cannot perform the action, then you cannot play the card. Special Case: Breakthrough can be also used to declare a revolution. In that case, you pay all your civil actions for the revolution instead of paying 1 for Breakthrough. You may do this only when all your civil actions are available. This card's effect lasts until the end of your turn. You do not get the resources physically. Just remember how many you have. When you pay a resource cost for building or upgrading a military unit, use these temporary resources first. If they are more than you need to cover the cost, then you may save the remainder for building or upgrading other units this turn. Temporary resources that are still unused at the end of the turn are lost. Similarly, the temporary extra military action is not represented by a red token. You just remember you have it. It is used instead of a red token the first time you spend a military action. If you do not use it during your Action Phase, it may be used to draw a military card at the end of your turn (which will be explained soon). In any case, it cannot be carried over to a later turn. Through the Ages is a complex game. It is not easy to plan your actions perfectly in your head. You may need to try a few actions before you can tell whether your Action Phase will end well. If it looks like your Action Phase is going badly, you should be allowed to take back your actions and try a different approach. Of course you don't want to overdo it. Taking back too many actions slows down the game, and it can be difficult to undo things once you have moved a lot of tokens around. Instead of placing spent action tokens next to your government card, you can place them at the location where you performed that action. If you increase your population, you can denote this with a white token in your worker pool. If you build or upgrade something, put the token next to the worker you moved so you can remember which one it was. When you take a card from the card row, you can put the tokens you spent on that space. And if you play a technology, you can put a white token on it ... unless it's a government, of course. This bookkeeping trick makes it easy to see what you have done this turn, which makes it easier to take back actions if you need to. When you reset your actions at the end of your turn, collect all your white and red tokens and return them to your government card. Your End-of-Turn Sequence on your second turn will probably be similar to your first turn, except you will now have a chance to draw military cards. Just follow the steps in the order shown on your player board. You will not discard military cards, and you will not have an uprising. Corruption and consumption are unlikely, so we will explain them in the next chapter. You will score 1 science point for your lab, or perhaps 2 if you built a second lab. If you built a temple, you will score 1 culture point. You will produce food and resources. This will be more than last turn if you built a farm or mine. After your Production Phase, draw 1 military card from the current military deck for each of your remaining available military actions. You had 2 military actions. If you did not spend any of them on building or disbanding units, you will draw 2 military cards from the Age I military deck. Keep them in your hand and do not show them to anyone. Military cards are kept secret.